Life, the BBC's latest totally unbelievable nature documentary, is airing in 10 episodes between now and Christmas. Not only is the footage as incredible as you'd expect; the studio sent some production notes our way explaining how scenes were shot. "Filming the bouncing toad was very challenging; the remote mountain plateau is one mile high and 26 square miles in area, whilst the toad is one inch long and very elusive. The tarantulas which prey on them are also very hard to find. To give the crew the best chance of finding and filming them, the expert on these creatures came on the shoot. He searched for a week before the crew's arrival to find both species and a location where they could come together and where the toad would demonstrate its bouncing-ball method of escape. This allowed the cameraman to set up his slow-motion camera in the right place. The scientist was able to ensure that the toad was never in danger of being harmed by the tarantula as a result of us filming them. The technique was a total success - the toad tucked its legs in, rolled and bounced, allowing the crew to film its method of escape in slow-motion detail." "A Jesus Christ lizard running on water is so fast that a human would have to run at 65 miles per hour to achieve the same trick. The speed makes it an enormous challenge to film. 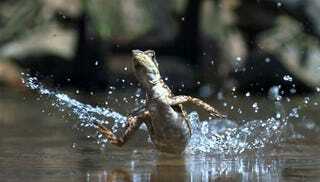 After consulting with a scientist at Harvard University who has made a ground-breaking study of the lizard's water sprint, the crew decided that as well as filming the behaviour at normal frame rates they would attempt to capture the close up details of the lizard's run with a slow-motion camera filming at 2000 frames per second (i.e. slowed down by 80 times). It's very hard to predict exactly where and when a lizard will run, what's more it's all so quick that once the lizard is spotted it's gone in a blur! Learning from the scientist's observation methods was essential and as a result it was decided to film the details of the sprint would need some degree of control to ensure that the crew had some idea of where and when the lizard would run. They travelled to Belize, home of the lizard, to work with local animal experts who had some lizards in natural forest enclosures. If, and when, these lizards decided to run, they always ran along the same stretch of water, where the cameraman could station his camera. The key to success was using the latest digital slow-motion camera that continuously records into a memory buffer, so that when the cameraman hits the trigger button he downloads the action that took place a second or so before that moment. Whenever a lizard sprinted past the cameraman over the water the cameraman hit the trigger, desperately trying to keep the lizard in the frame and in focus. The final end result of this was stunning, slow motion shots of the lizards, with every drop of water visible as they sprinted through the surface." OK, we don't actually have any notes on how this was shot. But the macro shot of water beading up on the gecko's hydrophobic skin is gorgeous. The above clips are from Episode 2: Reptiles and Amphibians. The series is playing now on BBC One.